Ubiquiti Networks | The Best WiFi Router & Networks - Smart Homes, Inc.
What Makes Ubiquiti Wireless Access Points the Best? Ever get frustrated at WiFi? It can be quite annoying to have a slow wireless internet experience or frequent drops when moving around a home or office. With smart home devices relying on strong WiFi to keep the house operating without a hitch, it is very important to invest in an infrastructure that is not only fast and reliable, but proven to keep running for years to come. The Ubiquiti name has developed a reputation of a no-compromise wireless solution on top of extremely aggressive price-points. 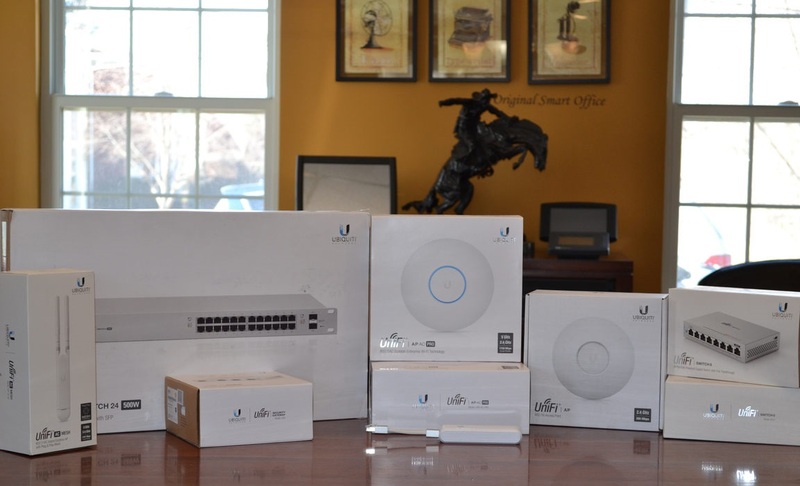 Here at Smart Offices of Michigan, we prefer to deploy Ubiquiti solutions for our clients, family, and friends. Since the company incorporated in 2010, just eight years ago, they have been shaking up the WiFi world. First, they focused their efforts on assisting developing and emerging markets. Since WiFi strength historically cannot travel very far, attempting to “connect” emerging markets is quite an undertaking. To the tech world’s surprise, they pulled it off! Ubiquiti’s wireless access points are no larger than a standard WAP (wireless access point), but can reach distances of at least 25 kilometers! Ubiquiti’s airFiber series showcases how their long-range lineup has evolved in the past eight years. With a new extra-long-range setup, one doesn’t need to sacrifice in speeds. At 2.4 to a whopping 24 GHz, up to 2Gbps, and options over 300 kilometers point-to-point, the airFiber line is best-in-business for range and speed. The airMax products, and airMax Legacy, are the workhorse WAPs that started it all. They have a wide range of options for mounting, range, speeds, and even design. Some airMax WAPs are even designed to penetrate outdoor objects, such situations with no possible line-of-sight. A quality router is a must-have for use with access points of Ubiquiti’s caliber. EdgeMAX routers have features way beyond standard shelf models. PoE is handled by the router via 24V dedicated or passthrough port, each port is gigabit ethernet, and it’s all controlled by their unrivaled Network Management System software. As Ubiquiti entered the US home and office market, they refined their UNMS (Ubiquiti Network Management System) along with commercial and consumer access points. Now, the UniFi WAPs are growing into the most popular and trusted WiFi communication devices in both the home and office. 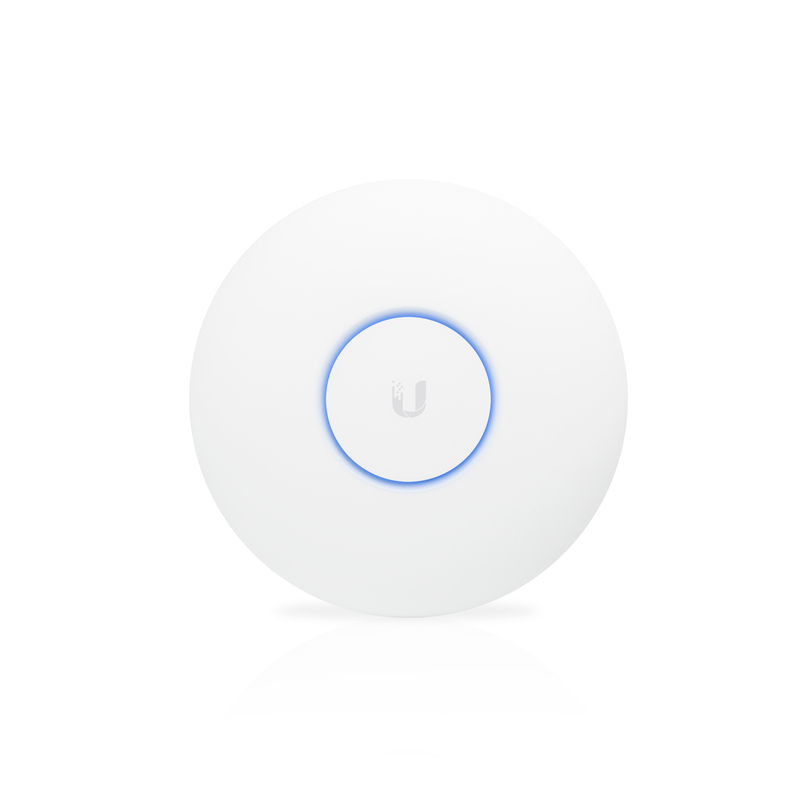 A single UniFi device covers so much range, a single device is sometimes all that’s needed! Meant for the home, the airCube can look great on any shelf, cabinet, or counterspace with its compact, modern design. It even has integrated 24V PoE passthrough to carry data and power to another access point for simple daisy-chain configurations. Supporting 2×2 MIMO, AC WiFi, 4 gigabit ports, 2.4 & 5.0 GHz simoultaneous frequencies, this little WAP packs quite a punch! Touted as the device that puts consumer WiFi solutions to shame, The UniFi AC Pro AP features and performance are better than off-the-shelf solutions for a fraction of the cost. It supports the latest Wi-Fi 802.11ac, 3×3 MIMO (multiple in, multiple out) technology in a sleek, industrial design. It is ideal for a multitude of scenarios that need excellent coverage or maximum‑performance for wireless networks. Ubiquiti is constantly adding new products beyond WiFi that they plan to offer. Already, they have surveillance cameras, VoIP phones, dimmers, sensors, and more! Need a home WiFi evaluation? Contact us today!